Counties in the Midwest can’t seem to catch a break. The historic flooding that killed at least four people is expected to continue through May, the National Oceanic and Atmospheric Administration (NOAA) reported. Flooding in the area has already devastated infrastructure, washed away bridges and closed roads in many counties. County and state officials declared disasters and issued evacuation orders as waters rose after Winter Storm Ulmer transformed into a “bomb cyclone” mid-March, according to the National Weather Service. The storm’s impact was felt in Nebraska, Iowa, South Dakota, Wisconsin, Minnesota and other bordering states. According to The Weather Channel, 42 locations reached historic flooding levels. The region experienced record snowfall this season with certain areas receiving 20 to 40 inches above normal totals, according to the National Weather Service. Storm systems brought rainfall to areas with saturated and frozen soil, leading to runoff from snowmelt that caused widespread flooding in the area. The upper Mississippi and Red River of the North basins have received precipitation this spring up to 200 percent above normal, according to NOAA. The areas at greatest risk for flooding are in the upper, middle and lower Mississippi River basins. The Nebraska Strong Drive will raise money through the Red Cross to aid Nebraskans displaced by the recent flooding. The phone number designated for the Nebraska Strong Drive is 1-844-278-8555 (phone line will be staffed 5 a.m. – 11 p.m. central March 22) or donations can be made online, choosing “Disaster Relief” in the “I want to support” menu. “This is shaping up to be a potentially unprecedented flood season, with more than 200 million people at risk for flooding in their communities,” said Ed Clark, the director of NOAA’s National Water Center. NOAA predicts above average spring rain and snow, which will result in flooding that will continue through May. President Trump approved Nebraska’s expedited request for federal disaster assistance and Iowa’s request for an expedited disaster declaration after Vice President Mike Pence visited both states to survey the damage. Iowa Governor Kim Reynolds estimated nearly $1.7 billion in damage in the state while the flooding in Nebraska is estimated to be around $1.4 billion in damage, The New York Times reported. In Nebraska, the devastation has been widespread across the state, with the northeast quadrant as one of the hardest hit areas, said Larry Dix, the executive director at the Nebraska Association of Counties. The biggest issue facing counties in Nebraska is the damage to infrastructure from floodwaters, he said, adding that the state has many miles of river that run out of the Rocky Mountains. Borgeson witnessed the damage firsthand in Douglas County. “We had rescues going on for quite some time to get folks out that didn’t get out right away or couldn’t get out right away,” she said. Floodwaters completely wiped out bridges and homes and two Douglas County nursing homes had to be evacuated, she said. According to Borgeson, organizations like the American Red Cross, the Salvation Army and volunteers from churches, community centers, businesses and employees from the county have pitched in to help those affected by the disaster. The Humane Society is working to take care of animals that have been displaced, she noted. “It is absolutely mindboggling and heartwarming at the same time how people within the community and county pull together at a time of disaster,” Borgeson said. There will be a long-term impact from the flooding for both the farming and ranching world, Borgeson predicted. She credits the county’s unified command center for coordinating the disaster situation with communities impacted by the flooding. The command center encompasses fire, rescue, police and sheriff units. Central Nebraska’s Custer County received 12 inches of snow before being hit with rain and frost. County Highway Superintendent Chis Jacobsen said the damage from the flooding has been the biggest challenge he’s experienced in 30 years. “We have some roads that are still closed. Our first initial point was to get constituents in and out at least in a single lane,” he said. Custer County has 1,800 miles of active roadway and Jacobsen said he does not know of any roads that have not been affected by the weather. Asphalt roads have taken the brunt of the damage because of rapid change in temperatures, he said. In western Nebraska, Banner County was also hit with 12 inches of snow and 60-70 mph winds. With the warmer weather melting the snow, floodwaters were expected to rise. 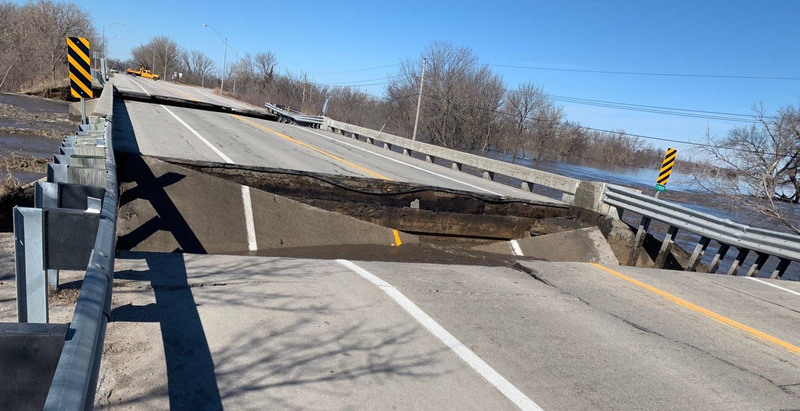 Banner County Commissioner Robert Post emphasized that for small counties without large budgets or large tax bases, it is difficult to face the expenses to clear and repair damaged roads. “We think when we’re done, we’re going to need $80,000 to do the repair work,” Post said. It’s more than just Nebraska that has been affected by the historic floods. Water started rising in Mills County, Iowa, when a levee was breached at the point where the Missouri River meets the Platt River. According to Mills County Supervisor Richard Crouch, water came through the breach at approximately 380,000 cubic feet per second. Crouch said around 680 homes in the county have been affected by the floodwater or have been completely destroyed. In the county, the City Water Works department filled with six to eight feet of water, causing the water plant to shut down, Crouch said. The county is working to repair the plant. The biggest problem the county faces is the impact of the flooding on farmland. Crouch described how floodwaters carry sand, debris and cornstalks and leave them in large piles where they take time to dry out. “There will be a lot of farmers who will not get a crop in and the bad part is a lot of them never got last year’s crop in because of wet weather,” he said. Crouch said county residents who were evacuated are being let back in on a road-by-road basis if workers have cleared debris. “It’s taking a day to clean a mile,” he said. Crouch said he does not think Mills County will see the same volume of water as the initial flooding in the upcoming weeks, but said the county may continue to see flooded areas until the river completely recedes back down its banks.